A new flavor of Match 3 game from the makersofhit apps Blossom Splash or！Match 3 or more buds to collect them,andsweeten the value of neighboring buds. Blossom Crush takes youon apuzzle game of hundreds of levels and obstacles in springcomming.It’s easy to play but challenging to master! Blossom Splash Legend is a newest match 3 game of flowerstheme.Blast the blossom flower buds after line them up and enjoythe veryaddictive splash and most interesting match-three casualpuzzlegame. Link 3 or more candy buds of the same color to blastthem.Watch as you set off an epic chain reaction of bloomingflowerscandies. 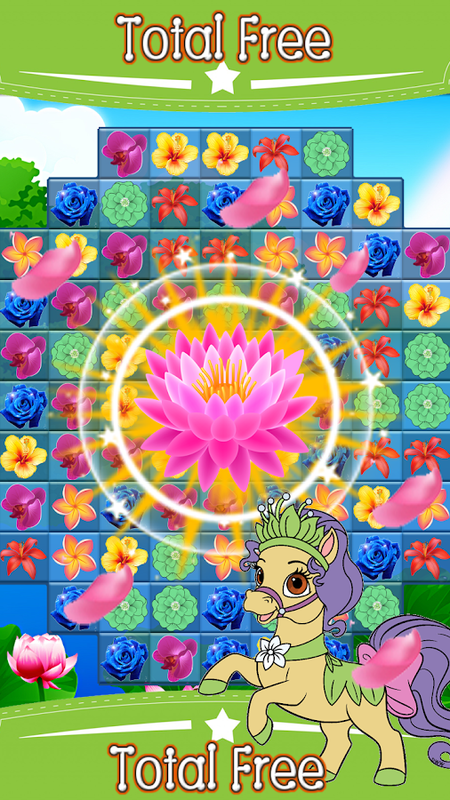 Collect buds and flowers to build your own dreamgardenpandora Paradise and get awesome bloosom. Become a flower chasing butterflies and bees to collect all thebudsthrough the winter, remove obstacles to greet spring. Ofcourse youneed a skill of flower craft. We look forward tofruition, you willbe flavor of legends. Blossom Splash Legend iscompletely free toplay and you can get free diamonds in the game.Match fever bloomtrip is coming. ● Hundreds of challenge levels to achieve the target. ● Two special crops met a boom crops can bring a specialeffect,more surprise need for you to discover. ● Easy and fun to play, classic & awesome Match-3game,challenging to master. ● Effects set in beautiful gardens and stunning graphics onyourblossom trip. ● Link 3 or more flower to clear up and get high score. * Switch and match 3 or more flowers across the cooldreamworld. * Mouth-watering new graphics, Blossom Crush Legend never lookedsotasty. * Match 4 same crops in a line or row, you will get a specialcropswhich can eliminate all the flowers a whole line or row. * Use some better strategies to get more points. * Two specialcropsmet a boom crops can bring a special effect. * Use more props to trim more flowers. It’s all about flower power so the more flowers you growthebetter! Candy Pop Bubble is the most classic andnewbubble shoot games 2016. This free version is the only onethatcontains Puzzle Mode, Arcade Mode.With 1000+ puzzle levels you will never get bored withthisgame.How to Play:1.Tap where you want to shoot bubble2.To group 3 or more bubbles to make them bust3.Clear all the bubbles on the screen to level up,and try to get3stars on each level.Tips: Breaking the bubbles continuously can get pointsasbonus!Features:1. Puzzle Mode - 1000+ fun levels of saga puzzles2. Arcade Mode - The bubbles will go down gradually so you needtoshoot quickly to avoid deathCandy Pop Bubbles games free has 1000+ levels to play, andmorefree, fun and addictive levels will be added to this CandyPopBubble free download game!Deluxe HD graphics suitable for kids, toddlers.You can continueyourgame to make sure that you don’t lose any progress. So justsitback, relax and alongside those colorful bubbles. 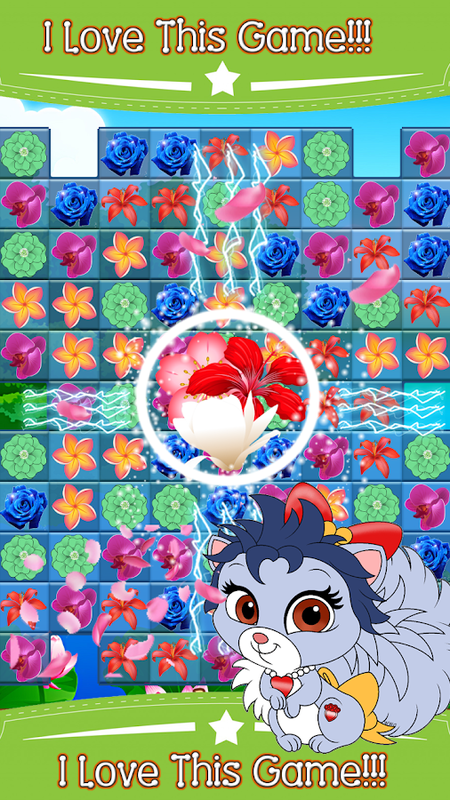 Colorful flowers, more divine combinationsandchallenging game modesA new flavor of Match 3 game from the makers of hit appsBlossomSplash or！Match 3 or more buds to collect them, and sweetenthevalue of neighboring buds. 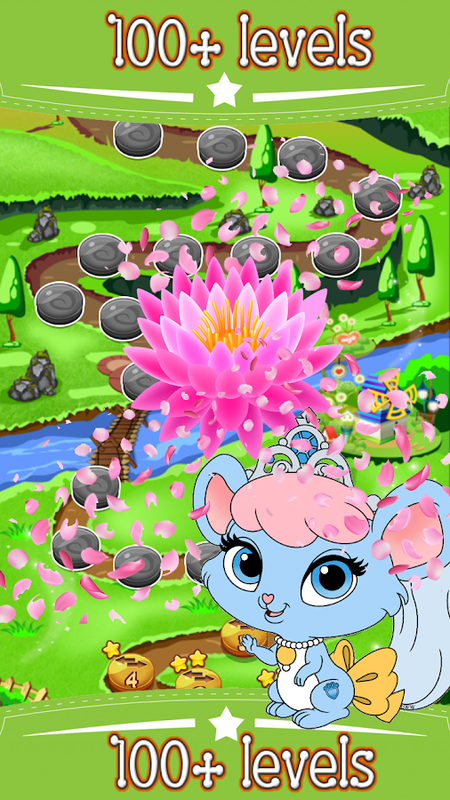 Blossom Crush takes you on a puzzlegameof hundreds of levels and obstacles in spring comming. It’seasy toplay but challenging to master!Arcade switch bottles and flowers to release purple soda andsavethe buds Frenzy, garden ParadiseClassic Balloon – match flowers to smash the ice saga and Link 3ormore buds of the same color to grow themClear an entire flowerbed to get an 'Awesome Blossom! 'Blossom Splash Legend is a newest match 3 game of flowerstheme.Blast the blossom flower buds after line them up and enjoythe veryaddictive splash and most interesting match-three casualpuzzlegame. Link 3 or more candy buds of the same color to blastthem.Watch as you set off an epic chain reaction of bloomingflowerscandies. Collect buds and flowers to build your own dreamgardenpandora Paradise and get awesome bloosom.Become a flower chasing butterflies and bees to collect all thebudsthrough the winter, remove obstacles to greet spring. Ofcourse youneed a skill of flower craft. We look forward tofruition, you willbe flavor of legends. Blossom Splash Legend iscompletely free toplay and you can get free diamonds in the game.Match fever bloomtrip is coming.+++ Features of Blossom Crush +++● Three hundreds of challenge levels to achieve the target.● Have a sweet flower trip● Two special crops met a boom crops can bring a specialeffect,more surprise need for you to discover.● Easy and fun to play, classic & awesome Match-3game,challenging to master.● Effects set in beautiful gardens and stunning graphics onyourblossom trip.● Link 3 or more flower to clear up and get high score.☆☆☆☆☆ How to Play? ☆☆☆☆☆* Switch and match 3 or more flowers across the cooldreamworld. * Mouth-watering new graphics, Blossom Crush Legend never lookedsotasty. * Match 4 same crops in a line or row, you will get a specialcropswhich can eliminate all the flowers a whole line or row. * Easy and fun to play, challenging to master* Use more props to trim more flowers* Achieve the target score to win the levels. * Use some better strategies to get more points. * Two specialcropsmet a boom crops can bring a special effect. * Use more props to trim more flowers. * Easily sync the game between devices and unlock full gamefeatureswhen connected to the internet+++ BOOSTERS +++- Extra blossom splash: Give +5 extra moves- Blossom hop: Give +30 extra seconds- Blossom Boom: Destroying 1 item on game field- Blossom Pop: get a yummy blossom, multicolor bomb on theplayingfield at the start of the game- Colorful flower: crush & jam all yummy flowers havesamecolor- Flower Blast Line: crush & jam all yummy flowers on thepuzzlerow- Super Flower Blast: crush & jam all yummy flowers bothrow& lineIt’s all about flower power so the more flowers you growthebetter! How to play Shoot Bubble :1. Tap where you want the bubbles to go.2. Make combinations of 3 or more bubbles that have the same colorto make them burst.2. Group 3 or more bubbles to make them pop.3. Clear all the bubbles on the screen to get to a new level.The main objective is to destroy all the marbles. To achieve thisgoal, a player can apply different strategies:+ Collapse - find existing chains of 3 or more bubbles.+ Cause avalanches - manage to pop enough bubbles as to cut off anentire section – causing all of the bubbles underneath to pop aswell.+ Collect new chains of balls.+ Sort out marbles by colors and shooting them at different anglesto quickly create a desired combination.Have 2bubble mode for this bubbles shooter game :+ Puzzle Mode : more 640 hundred fun levels of saga puzzles,bubbles Shoot bubbles base on level.+ Arcade Mode : Bubble Panda Pop base on time ,the bubbles will godown, and nonstop, so you quickly and so fast to get many scorebase time, if you don't die. Bubble Fruit is the most classic and newbubbleshoot games 2016. This free version is the only one thatcontainsPuzzle Mode, Arcade Mode.With 1000+ puzzle levels you will never get bored withthisgame.How to Play:1.Tap where you want to shoot bubble2.To group 3 or more bubbles to make them bust3.Clear all the bubbles on the screen to level up,and try to get3stars on each level.Tips: Breaking the bubbles continuously can get pointsasbonus!Features:1. Puzzle Mode - 1000+ fun levels of saga puzzles2. Arcade Mode - The bubbles will go down gradually so you needtoshoot quickly to avoid deathBubble Fruits games free has 1000+ levels to play, and morefree,fun and addictive levels will be added to this Bubble Fruitfreedownload game!Deluxe HD graphics suitable for kids, toddlers.You can continueyourgame to make sure that you don’t lose any progress. So justsitback, relax and alongside those colorful bubbles. How to play Mushroom Bubble :1. Tap where you want the bubbles to go.2. Make combinations of 3 or more bubbles that have the samecolorto make them burst.2. Group 3 or more bubbles to make them pop.3. Clear all the bubbles on the screen to get to a new level.The main objective is to destroy all the marbles. To achievethisgoal, a player can apply different strategies:+ Collapse - find existing chains of 3 or more bubbles.+ Cause avalanches - manage to pop enough bubbles as to cut offanentire section – causing all of the bubbles underneath to popaswell.+ Collect new chains of balls.+ Sort out marbles by colors and shooting them at differentanglesto quickly create a desired combination.Have 2bubble mode for this bubbles shooter game :+ Puzzle Mode : more 640 hundred fun levels of saga puzzles,bubblesMushroom Bubble base on level.+ Arcade Mode : Mushroom Bubble base on time ,the bubbles willgodown, and nonstop, so you quickly and so fast to get manyscorebase time, if you don't die. Bubble Panda Pop 2 : Christmas isClassiccasual puzzle game really fun to play in all time youractivityBubble Panda Pop 2 : Christmas mania. * Play fun Space games With Your Friends & Family! Join thefunnew matching game all your friends are playing! * Beautiful animation & cute graphic, travel throughthecolorful lands of bubble mania to relax with exciting game-playandamazing level design. Help the people you meet have aPandaParty! * Play the best bubble 2016 game free and watch the hoursflyby!To play this game is really simple just Make combinations of 3ormore bubbles with same color to make them fall down/crush/burstandClear all the bubbles to win game. This game have deluxebeautifullcolor bubbles ready to play for you bubbles shootermaniaShoot bubble worlds/Bubble Panda Pop 2 : Christmas puzzleadventureis one of the most popular fun journey game pop/burst/falldownbubble object game! Another option to play game when youbored.#one of the number 1 legend Puzzle deluxe mania game ontheworld.Shoot/shooter bubble worlds is journey games. Play for free asyoushoot/shooter poke deluxe beautiful bubbles with journeyadventuremore than 600 level and Shoot every bubble like a witchtrow aspell with their stick magic witch and make burst/falldown/crushevery deluxe colorful bubble as many you can bubblesmania. everydeluxe poke color like blue bubble,orangebubbles,greenbubble,purple bubble and other mix color poke deluxebubble readyto burst and crush as you can. it good news for youBubble PandaPop 2 : Christmas mania journey loversHow To Play:- Shoot/poke bubble with tap your screen.. and directed at least3bubble to make them burst/crush- Mark your target with same color bubble- Bouncing/bounce bubble with Tap the Pole at right or leftsideyour Phone or tablet- Clear all bubble to finish level and play another funbubblepuzzle in this game- Clear all bubble as fast you can because you have limited timetoburst/crush bubbleFeatures:- Colorful bubble with cool design GUI- Have 8 color bubble likeblue,orangelitght,orange,purple,green,mix color blue,mix colorpurple and manymore- Have more than 600 level ready to play and will addmoresoonTips to Play :- Bouncing/bounce bubble in this game to make clear or finishlevelmore faster- Shoot/poke bubble with same color at least 3 bubble- Shoot bubble as fast you can like a witch will wars spell tootherwitch with their stick magic witchYou will love the fun bubble shoot mania worlds and burst orcrushbubble lines in this puzzle game with your hand, yourcreativityand excitement to shoot/poke bubble will help you tofinish alllines bubble puzzle more faster and easier.Shoot bubble world wars is a wildly addictive bubble linescrushlegend puzzle game!Tap on your screen to poke/shoot adjacent bubble to makethemcrush/destroy, and try to scoring as many points aspossible!The power of magic witch wars shoot bubble is in your hands!Shootbubble and match 3 deluxe bubble to walk through limitedlevels inthis completely journey shoot legend bubble puzzle maniaadventureand more than enough to dissaapers your bored time .So let's get started play Shoot bubble world wars mania andstartyou journey adventure in bubble world now!Features:1. Puzzle Mode - 1000+ fun levels of saga puzzles2. Arcade Mode - The bubbles will go down gradually so you needtoshoot quickly to avoid deathBubble Panda Pop 2s games free has 1000+ levels to play, andmorefree, fun and addictive levels will be added to this BubblePandaPop 2 free download game!Deluxe HD graphics suitable for kids, toddlers.You can continueyourgame to make sure that you don’t lose any progress. So justsitback, relax and alongside those colorful bubbles. Link your way through full ofcolorfulbudsColorful fruits, more divine combinations and challenginggamemodesA new flavor of Match 3 game from the makers of hit apps fruitBlastor！Match 3 or more buds to collect them, and sweeten thevalue ofneighboring buds. fruit Crush takes you on a puzzle gameof hundredsof levels and obstacles in spring comming. It’s easy toplay butchallenging to master!Arcade switch bottles and fruits to release purple soda and savethebuds Frenzy, garden ParadiseClassic Balloon – match fruits to smash the ice saga and Link 3ormore buds of the same color to grow themClear an entire fruitbed to get an 'Awesome fruit! 'fruit Blast Legend is a newest match 3 game of fruits theme.Blastthe fruit fruit buds after line them up and enjoy theveryaddictive splash and most interesting match-three casualpuzzlegame. Link 3 or more candy buds of the same color to blastthem.Watch as you set off an epic chain reaction of bloomingfruitscandies. Collect buds and fruits to build your own dreamgardenpandora Paradise and get awesome bloosom.Become a fruit chasing butterflies and bees to collect all thebudsthrough the winter, remove obstacles to greet spring. Of courseyouneed a skill of fruit craft. We look forward to fruition, youwillbe flavor of legends. fruit Blast Legend is completely free toplayand you can get free diamonds in the game. Match fever bloomtripis coming.+++ Features of fruit Crush +++● Hundreds of challenge levels to achieve the target.● Have a sweet fruit trip● Two special crops met a boom crops can bring a specialeffect,more surprise need for you to discover.● Easy and fun to play, classic & awesome Match-3game,challenging to master.● Effects set in beautiful gardens and stunning graphics onyourfruit trip.● Link 3 or more fruit to clear up and get high score.☆☆☆☆☆ How to Play? ☆☆☆☆☆* Switch and match 3 or more fruits across the cooldreamworld. * Mouth-watering new graphics, fruit Crush Legend never lookedsotasty. * Match 4 same crops in a line or row, you will get a specialcropswhich can eliminate all the fruits a whole line or row. * Easy and fun to play, challenging to master* Use more props to trim more fruits* Achieve the target score to win the levels. * Use some better strategies to get more points. * Two specialcropsmet a boom crops can bring a special effect. * Use more props to trim more fruits. * Easily sync the game between devices and unlock full gamefeatureswhen connected to the internet+++ BOOSTERS +++- Extra fruit splash: Give +5 extra moves- fruit hop: Give +30 extra seconds- fruit Boom: Destroying 1 item on game field- fruit Pop: get a yummy fruit, multicolor bomb on the playingfieldat the start of the game- Colorful fruit: crush & jam all yummy fruits havesamecolor- fruit Blast Line: crush & jam all yummy fruits on thepuzzlerow- Super fruit Blast: crush & jam all yummy fruits both row&lineIt’s all about fruit power so the more fruits you growthebetter! Colorful flowers, more divine combinations andchallenging game modesA new flavor of Match 3 game from the makers of hit apps BlossomBlast or！Match 3 or more buds to collect them, and sweeten thevalue of neighboring buds. 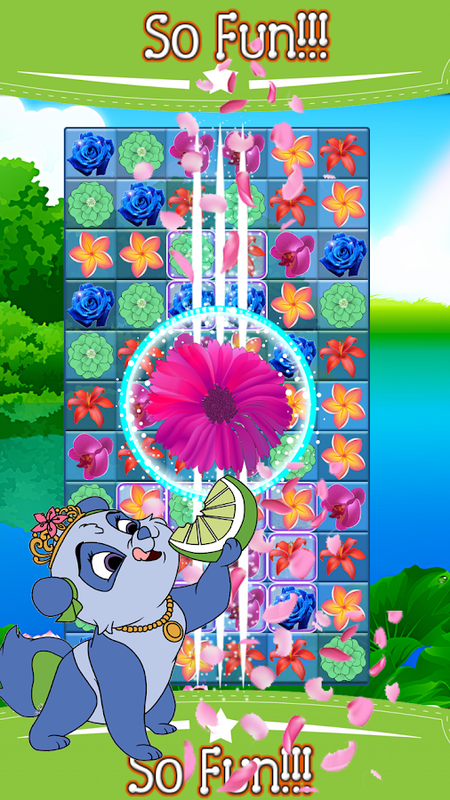 Blossom Crush takes you on a puzzle gameof hundreds of levels and obstacles in spring comming. It’s easy toplay but challenging to master!Arcade switch bottles and flowers to release purple soda and savethe buds Frenzy, garden ParadiseClassic Balloon – match flowers to smash the ice saga and Link 3 ormore buds of the same color to grow themClear an entire flowerbed to get an 'Awesome Blossom! 'Blossom Blast Legend is a newest match 3 game of flowers theme.Blast the blossom flower buds after line them up and enjoy the veryaddictive splash and most interesting match-three casual puzzlegame. Link 3 or more candy buds of the same color to blast them.Watch as you set off an epic chain reaction of blooming flowerscandies. Collect buds and flowers to build your own dream gardenpandora Paradise and get awesome bloosom.Become a flower chasing butterflies and bees to collect all thebuds through the winter, remove obstacles to greet spring. Ofcourse you need a skill of flower craft. We look forward tofruition, you will be flavor of legends. Blossom Blast Legend iscompletely free to play and you can get free diamonds in the game.Match fever bloom trip is coming.+++ Features of Blossom Crush +++● Hundreds of challenge levels to achieve the target.● Have a sweet flower trip● Two special crops met a boom crops can bring a special effect,more surprise need for you to discover.● Easy and fun to play, classic & awesome Match-3 game,challenging to master.● Effects set in beautiful gardens and stunning graphics on yourblossom trip.● Link 3 or more flower to clear up and get high score.☆☆☆☆☆ How to Play? ☆☆☆☆☆* Switch and match 3 or more flowers across the cool dreamworld. * Mouth-watering new graphics, Blossom Crush Legend never looked sotasty. * Match 4 same crops in a line or row, you will get a special cropswhich can eliminate all the flowers a whole line or row. * Easy and fun to play, challenging to master* Use more props to trim more flowers* Achieve the target score to win the levels. * Use some better strategies to get more points. * Two special cropsmet a boom crops can bring a special effect. * Use more props to trim more flowers. * Easily sync the game between devices and unlock full gamefeatures when connected to the internet+++ BOOSTERS +++- Extra blossom splash: Give +5 extra moves- Blossom hop: Give +30 extra seconds- Blossom Boom: Destroying 1 item on game field- Blossom Pop: get a yummy blossom, multicolor bomb on the playingfield at the start of the game- Colorful flower: crush & jam all yummy flowers have samecolor- Flower Blast Line: crush & jam all yummy flowers on thepuzzle row- Super Flower Blast: crush & jam all yummy flowers both row& lineIt’s all about flower power so the more flowers you grow thebetter! Link your way through full ofcolorfulbudsColorful flowers, more divine combinations and challenginggamemodesA new flavor of Match 3 game from the makers of hit appsBlossomSplash or！Match 3 or more buds to collect them, and sweetenthevalue of neighboring buds. 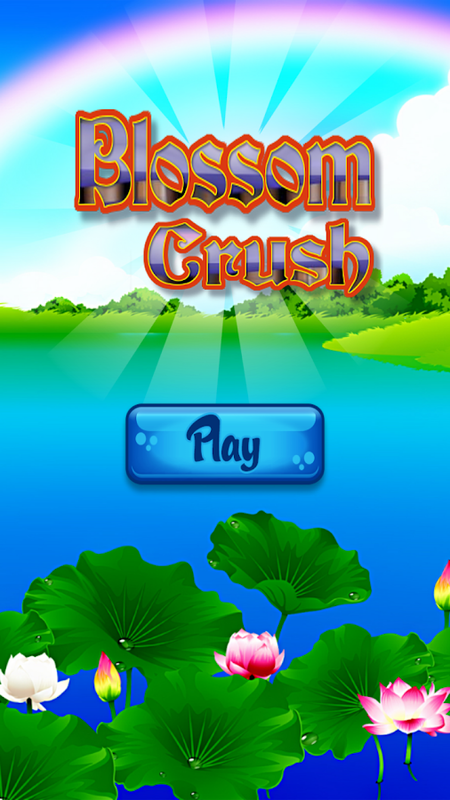 Blossom Crush takes you on a puzzlegameof hundreds of levels and obstacles in spring comming. It’seasy toplay but challenging to master!Arcade switch bottles and flowers to release purple soda andsavethe buds Frenzy, garden ParadiseClassic Balloon – match flowers to smash the ice saga and Link 3ormore buds of the same color to grow themClear an entire flowerbed to get an 'Awesome Blossom! 'Blossom Splash Legend is a newest match 3 game of flowerstheme.Blast the blossom flower buds after line them up and enjoythe veryaddictive splash and most interesting match-three casualpuzzlegame. Link 3 or more candy buds of the same color to blastthem.Watch as you set off an epic chain reaction of bloomingflowerscandies. Collect buds and flowers to build your own dreamgardenpandora Paradise and get awesome bloosom.Become a flower chasing butterflies and bees to collect all thebudsthrough the winter, remove obstacles to greet spring. Ofcourse youneed a skill of flower craft. We look forward tofruition, you willbe flavor of legends. Blossom Splash Legend iscompletely free toplay and you can get free diamonds in the game.Match fever bloomtrip is coming.+++ Features of Blossom Crush +++● Hundreds of challenge levels to achieve the target.● Have a sweet flower trip● Two special crops met a boom crops can bring a specialeffect,more surprise need for you to discover.● Easy and fun to play, classic & awesome Match-3game,challenging to master.● Effects set in beautiful gardens and stunning graphics onyourblossom trip.● Link 3 or more flower to clear up and get high score.☆☆☆☆☆ How to Play? ☆☆☆☆☆* Switch and match 3 or more flowers across the cooldreamworld. * Mouth-watering new graphics, Blossom Crush Legend never lookedsotasty. * Match 4 same crops in a line or row, you will get a specialcropswhich can eliminate all the flowers a whole line or row. * Easy and fun to play, challenging to master* Use more props to trim more flowers* Achieve the target score to win the levels. * Use some better strategies to get more points. * Two specialcropsmet a boom crops can bring a special effect. * Use more props to trim more flowers. * Easily sync the game between devices and unlock full gamefeatureswhen connected to the internet+++ BOOSTERS +++- Extra blossom splash: Give +5 extra moves- Blossom hop: Give +30 extra seconds- Blossom Boom: Destroying 1 item on game field- Blossom Pop: get a yummy blossom, multicolor bomb on theplayingfield at the start of the game- Colorful flower: crush & jam all yummy flowers havesamecolor- Flower Blast Line: crush & jam all yummy flowers on thepuzzlerow- Super Flower Blast: crush & jam all yummy flowers bothrow& lineIt’s all about flower power so the more flowers you growthebetter! Colorful candies, more divine combinationsandchallenging game modesA new flavor of Match 3 game from the makers of hit apps candyBlastor！Match 3 or more buds to collect them, and sweeten thevalue ofneighboring buds. Candy Frozen Splash takes you on apuzzle game ofhundreds of levels and obstacles in spring comming.It’s easy toplay but challenging to master!Arcade switch bottles and candies to release purple soda andsavethe buds Frenzy, garden ParadiseClassic Balloon – match candies to smash the ice saga and Link 3ormore buds of the same color to grow themClear an entire candybed to get an 'Awesome candy! 'Candy Blast Legend is a newest match 3 game of candies theme.Blastthe candy buds after line them up and enjoy the veryaddictivesplash and most interesting match-three casual puzzlegame. Link 3or more candy buds of the same color to blast them.Watch as youset off an epic chain reaction of blooming candiescandies. Collectbuds and candies to build your own dream gardenpandora Paradiseand get awesome bloosom.Become a candy chasing butterflies and bees to collect all thebudsthrough the winter, remove obstacles to greet spring. Of courseyouneed a skill of candy craft. We look forward to fruition, youwillbe flavor of legends. Candy Blast Legend is completely free toplayand you can get free diamonds in the game. Match fever bloomtripis coming.+++ Features of Candy Frozen Splash +++● Hundreds of challenge levels to achieve the target.● Have a sweet candy trip● Two special crops met a boom crops can bring a specialeffect,more surprise need for you to discover.● Easy and fun to play, classic & awesome Match-3game,challenging to master.● Effects set in beautiful gardens and stunning graphics onyourcandy trip.● Link 3 or more candy to clear up and get high score.☆☆☆☆☆ How to Play? ☆☆☆☆☆* Switch and match 3 or more candies across the cooldreamworld. * Mouth-watering new graphics, Candy Frozen Splash never lookedsotasty. * Match 4 same crops in a line or row, you will get a specialcropswhich can eliminate all the candies a whole line or row. * Easy and fun to play, challenging to master* Use more props to trim more candies* Achieve the target score to win the levels. * Use some better strategies to get more points. * Two specialcropsmet a boom crops can bring a special effect. * Use more props to trim more candies. * Easily sync the game between devices and unlock full gamefeatureswhen connected to the internet+++ BOOSTERS +++- Extra candy splash: Give +5 extra moves- candy hop: Give +30 extra seconds- candy Boom: Destroying 1 item on game field- candy Pop: get a yummy candy, multicolor bomb on the playingfieldat the start of the game- Colorful candy: crush & jam all yummy candies havesamecolor- candy Blast Line: crush & jam all yummy candies on thepuzzlerow- Super candy Blast: crush & jam all yummy candies bothrow& lineIt’s all about candy power so the more candies you growthebetter! Are you addicted to match 3 games? Can’tgetenough of blasting jelly and candies on your phone? Jelly Crushisthe latest and coolest match three crush game for yoursmartphone.Swap three or more jellies to win and advance to thenext level.Explore this challenging jelly games world and winspectacularprizes!This jelly blast game will give you hours and hours of fun. Betheultimate hero and defeat evil creatures that lurk insidethebeautiful realm to win candy star! You are not alone indefeatingthe villains though. You will get a lot of help fromadorablefriends in the enchanting jelly garden. You can also askfor helpand favor from your Facebook friends. You will becomeaddicted tothis jelly match game in a very short time and you donot know howto stop playing. What is more exciting is that JellyCrush iscompletely free to install and play!Moreover, you can connect with your friends via facebooknetwork.Free share your score and defeat friend's score. Theleadboard gamealso show top 5 best friend's player.Jelly Crush Features:-Beautiful HD graphic with adorable jelly and characters thatwillhook you up.-Crush, smash, and blast the jellies with special bonuses thatwillhelp you pass difficult levels.-Create jelly blast combos to achieve maximum score and beatotherplayers.-It might look like a simple jelly games but Jelly Crushischallenging to master.-Explore hundreds of level in the amazing jelly games and youwillnever feel bored with this game.-Invite your friends to play this jelly blast game and competewiththem for the highest score.-Collect candy stars and get special prizes.-Unlock more levels and adventures with your achievements.-Sync your jelly blast game with your Facebook account so youwillnot lose your progress.-Share your achievement to your friends and brag about yourprogressand scores!How to play Jelly Crush:• Install this app on your phone or tablet for free!• Swipe a jelly to create a row of three or more of thesamejellies.• Create bonuses and combos when you match more than threecandiesto crush them at one move.• Think strategically how you can beat the level requirementwithinlimited moves.• Try to create a jelly blast as many times as possible to passthelevel.• After you fulfill all the requirements in a jelly game level,youcan move on to the next level.• Be careful! Your path to achieve greatness is not smooth. Youwillface many obstacles, challenges, and even villains!• Move on to another part of jelly garden and unlock morelocationthe more you play.• Finish the level with the least move possible to get higherscoresand more candy stars.Practice makes perfect! The more you play, the more you knowthetips and trick to beat every level in this addicting matchthreegame. If you fail a level, try try again until you beat it!Thisdeceptively simply match three game contains a lot ofhiddensurprises and twists to keep you excited. Learning how to winalevel is the best part of this game because it will challengeyourmind!We are always striving to provide the best user experienceforplayers. If you find any issue or have any feedback, feel freetosend us an email. Thanks! Sweet Blossom Splash Garden ManiaGet ready for Sweet Blossom SplashGarden Mania time!! Start a fun-tastic puzzle solving quest,There're tons of surprises for you to discover. Come on into thisamazingly tasty Sweet Blossom Splash Garden Mania world, and beginenjoying 200 levels of delicious challenges NOW!! !Journey from yourfarm and join friends on a lovely stroll as you solve flowerypuzzles across 150 levels full of plains, deserts, snow and evenfloating islands. :::Features:::- 200 sweet levels to explore! (LVnew update you soon. )- Easy to learn and enjoyable match 3 game forthe young & young at heart!- A new flavor of matching puzzlegame, challenging and delicious.- Unique power-ups speciallydesigned in each levels.- Innovative new gameplay: clear a way tocollect the target flower.====== How to Play ======- Match flowerblossom as many as you can to get higher score in group 3 or more.-Gather all types of seeds and flowers to complete the level beforeyour run out of moves- Solve delectable challenges using elegantdrag and match gameplay to create beautiful flowers- Collect acertain number of target flower sweet to pass the level.- flowerblossom is free to play.Blossom Garden is a brand new game brings anew way of match-3 fun in Cookie Star. New candies, New cookie,more divine, more star combinations and challenging game modesbrimming with purple sugar soda!Download Sweet Blossom SplashGarden Mania for free now. It’s Sodalicious! 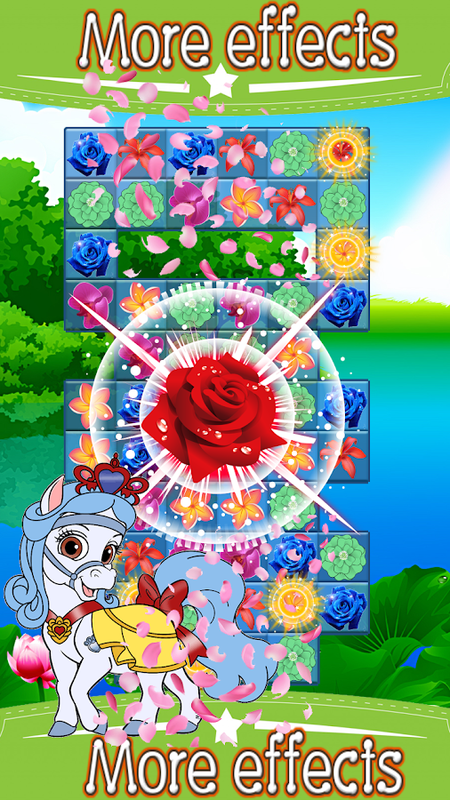 Blossom Crush is a brand new gameplay fromthehit game Blossom Blast Saga. Colorful flowers, morepowerfulcombinations and challenging game modes.Blossom Crush is completely free to play, enter the enchantedworldof the Blossom. Blast the blossom flowers to achieve yourgoals.☆☆☆☆☆ Highlighted Features of Blossom Crush ☆☆☆☆☆♥ Highly addictive gameplay♥ Easy and fun to play, but a challenge to fully master.♥ More than 350 levels and 3 pretty blossom scenes in thegame♥ Match 4 blossoms can get the blossom's bomb and 1 lighting.♥ Match 5 blossoms can win color-changing blossoms and2lightings.♥ Eliminate 20 blossoms continuous can win 1 lighting.☆☆☆☆☆ How to Play Blossom Crush ☆☆☆☆☆♥ Switch and match 3 or more flowers across the saga land.♥ Match the blossoms until the board transparency, the BlossomStarwill appear.♥ Make the Blossom Star down to last line to pass the level.Play Blossom Crush to make your way to dozens of colorfulgarden!Match and switch flowers in the most colourful puzzle gameyou'llever play. Archive three blossom stars to challenge yourfriends!Take on this wonderful Saga alone or play with friends tosee whocan get the best score! Blossom Garden Crush ParadiseGet ready for Blossom Garden CrushParadise time!! Start a fun-tastic puzzle solving quest, There'retons of surprises for you to discover. Come on into this amazinglytasty Blossom Garden Crush Paradise world, and begin enjoying 200levels of delicious challenges NOW!! !Journey from your farm andjoin friends on a lovely stroll as you solve flowery puzzles across150 levels full of plains, deserts, snow and even floatingislands. :::Features:::- 200 sweet levels to explore! (LV new updateyou soon. )- Easy to learn and enjoyable match 3 game for the young& young at heart!- A new flavor of matching puzzle game,challenging and delicious.- Unique power-ups specially designed ineach levels.- Innovative new gameplay: clear a way to collect thetarget flower.====== How to Play ======- Match flower blossom asmany as you can to get higher score in group 3 or more.- Gather alltypes of seeds and flowers to complete the level before your runout of moves- Solve delectable challenges using elegant drag andmatch gameplay to create beautiful flowers- Collect a certainnumber of target flower sweet to pass the level.- flower blossom isfree to play.Blossom Garden is a brand new game brings a new way ofmatch-3 fun in Cookie Star. New candies, New cookie, more divine,more star combinations and challenging game modes brimming withpurple sugar soda!Download Blossom Garden Crush Paradise for freenow. It’s Sodalicious!